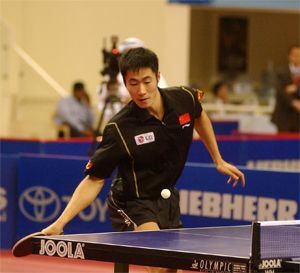 At some time or another you will probably be in the market to buy your own table tennis table, so that you can play and train at home. And I, as usual, have some advice to give that will help you in your quest to find the perfect ping-pong table. Firstly, forget the grand claims of the manufacturers. Unless you are already playing at state or national level, it’s unlikely that you need the most expensive table tennis table in the range – and even then I would think twice at paying that much. If it’s your first table for the family, go for the lower end of the market and let your family beat the hell out of the ping-pong table while they are learning how to play. If someone in the family then decides to get serious about their table tennis, you should be ready to replace the worn out table with a nice middle-of-the-range model that will be appreciated and looked after properly. Decide whether you are going to leave the table set up permanently or whether you will be frequently packing it up and putting it back. If you are going to be taking it up and down constantly, you will want something that is easy to setup, preferably a fold-up model that can be handled by one person, with rollers to allow you to move it without fuss. The good roller tables all have brakes on the wheels that can be applied to stop the table moving around when in use. In fact, I would probably go so far as to say that even if you plan to leave your ping-pong table set up all the time, buying a table with rollers is still a good idea – you never know when your plans will change, and the quality of the roller tables made by Stiga, Joola, Butterfly, Donic, DHS, Kettler etc. are top notch. Some players will argue that only table tennis tables with full 25mm (1 inch) thick tops are worth buying. While it is true that these tables do give a nice, even bounce, I have also played a fair bit of table tennis on 19mm (0.75 inches) thick tops and found little difference – certainly not hundreds of dollars worth! In fact, I spent many years at the beginning of my table tennis days playing on a cheap $150 AUS chipboard table in my garage, and that did the job well for someone learning to play. So I would recommend a 19mm thick top, unless you can find a thicker top for not much extra. Serious tournament players will probably want to go to a 25mm thick top just so that they have a similar table to what they will play on at tournaments. After all, what’s a few hundred extra dollars to a serious table tennis player who probably spends that in a couple of months on rubbers and speed glue? Make sure that the ping-pong table you buy has good strong legs and supports – it’s probably going to take quite a beating over the next few years, and you will need something well-made to stand up to the rough treatment. This is especially important if you have kids that are likely to treat the table a bit rougher than an adult will. Another nice feature to look for is leg levelers on the bottom of the legs. These can be very handy when the floor you are playing on isn’t level – the levelers can be screwed in and out to keep the height of the table at its standard 76cm (approx 30 inches) above the floor. Does it really matter which brand of ping-pong table you buy? Not really, as far as I am concerned. I personally have a Stiga Elite Roller, which I am very happy with. The main reason I bought this model is because it is the model that was used at my state table tennis center (they are now using the Stiga Expert Roller table), so it made sense for me to have the same type of table. But unless you are in a similar situation, it won’t really matter much whether the table is a Stiga, Joola, Tibhar or Butterfly table. Look for the best deal on price, not forgetting the features I have mentioned above. Watch out for table tops that are warped. Put your eye at table height from all sides of the table and look for any bending or warping which can affect the bounce of the ball. A 1 meter or 1 yard long spirit level can be very handy for assessing whether the table surface is not flat. No, not the old TV show – or the newer one either. Look for a net with attachments that have a soft covering where they grip the table – so that you don’t scratch the finish unnecessarily. You could probably put some sticky felt on the net clamps if you had to. Also make sure that the clamps that are used by the net don’t dig into the surface or the underside of the table. And of course, don’t drag the net clamps when taking the net off or putting it on! Make sure that the finish on the table is smooth and even, with no patches or rough spots. Look for any rough edges on the top and sides that could cut you if you accidentally grazed a part of your body along it. And bring a ruler with you to test the height of the bounce – remember that according to the Laws of Table Tennis, the ball should bounce about 23cm when a standard ball is dropped on it from a height of 30cm. And no, bouncing 24cm high in some places and 22cm high in others doesn’t average out! What about outdoor ping-pong tables? Outdoor table tennis tables come in a variety of formats – usually the legs and supports are waterproofed/rustproofed to stand up to the elements. The actual table surface can be metallic, wood with a waterproof coating, and even some forms of synthetic laminate. As usual, for better quality you have to pay more. The most important element for the recreational player is whether you can leave the table outside in the wind and rain. You’ll probably need to buy a fairly good quality table in order to get the level of weatherproofing you need. For serious players, it is probably more important whether the bounce on the outdoor table tennis table is similar to that of indoor tables. Either way, it would be a good idea to get a quality opaque plastic cover to help prevent the table fading and warping in the sun. I’ve got to admit, apart from these basics, I didn’t have much of a clue about this particular area of table tennis tables. So I went along to the About.com Table Tennis Forum, and lo and behold, the following information was found! According to stevebtx, metallic tables have been found to be shinier and a bit slower than normal tables, and the effect of spin is less. mzwang added that the Butterfly outdoor table tennis table had a different and lower bounce. The general consensus seems to be that unless you need a table that is going to stay outside at all times, you are better off buying an indoor table instead and taking it outside to play during good weather only. It also seems that most people who do play outside have quite a good time, especially when the weather is windy and the ball can do quite strange things! For those of you who have limited space at home, you may be considering the purchase of a compact ping-pong table. These tables are usually the same height as a normal table, but have smaller playing surfaces. My take on these tables is this: If you think you will only play table tennis for fun at home, and not play competitions, leagues or pennants, then these mini ping-pong tables can be a great way to spend a few hours with family and friends. But if you are considering getting serious about the sport, or you are just beginning and aren’t quite sure yet, I’d recommend against buying one of these tables – you can pick up too many bad habits if you play on them often. Because the dimensions are different, what is good placement on a compact table may be not so good on a normal table. You also may end up hitting a bit too spinny or soft in order to land the ball on the smaller table, and also get used to hitting too straight due to the lesser width. So keep smaller tables for fun and family, and if you are serious about competing, don’t spend too much time on them. If you already have a snooker, billiard or pool table at home, it can be tempting to buy a table tennis conversion top. A ping-pong conversion top is basically an attempt by manufacturers to cater for smaller family games rooms by allowing you to place a table tennis playing surface on top of a snooker, billiard or pool table. Sounds good in theory, right? Well, it depends on the size of your table. The official standard size of a snooker table is 11 feet by 5 feet 10 inches, while a table tennis table is 9 feet by 5 feet. Spot a problem? Yes, you are going to find it pretty tough to get near those short balls with an extra foot of snooker table protruding out under each side of the conversion top. Add the fact that the recommended height of snooker tables is between 33 ½ inches (85.1cm) to 34 ½ inches (87.6cm), while a table tennis table is supposed to be 30 inches (76cm) high, and you’ve got another problem. Unless you plan to play in platform shoes, you’ll be playing on a surface that is much too high. If you have a table that is smaller and lower (common billiard table sizes are 10 feet by 5 feet, 9 feet by 4 and a half feet, or 8 feet by 4 feet, with heights of around 29 ¼ inches to 31 inches), you might get away with a conversion top. Try to check the bounce of the ball with the conversion top actually on a billiard table, so you can see whether it actually bounces to the correct height of 23cm when dropped from a height of 30cm. As Rick Anderson pointed out in the About.com forum, table tennis tables can be dangerous where kids are concerned. First of all, there is the danger of the table tipping over when it is folded up and someone gives it a push in the wrong place. There is also the danger of the table collapsing if too much weight is placed upon it, or in the wrong spot (such as the area near the net for many fold up tables. Finally, there is the risks involved in opening the tables up for use on those models where both halves of the table are connected centrally. If one side of the table is let down first, and then the other side is let down, the area between the two inside edges has a guillotine-like motion which can be very dangerous if a child is around that area at the time. Even the models with the halves separate from each other can still be dangerous if a small child is able to let the table down unexpectedly. It would be a good idea to make sure that a table in the upright position is secured so that any kids can’t accidentally let the sides of the table down. Educating any kids (and adults too!) about the dangers involved in setting up and putting away the table would be a good thing to do as well. So there you have it, Greg’s Guide to Choosing a Table Tennis Table. Choose wisely and you will be sure to get years of good service, and hopefully years of good services, from your trusty table tennis table.